FREE concert by Compas Stars Zenglen! We had such a great time at the Big Night launch in March – here are some photos. Compas groups, ZENGLEN! Between the sets, enjoy a short masquerade show with outrageous Haitian carnival costumes. The Haitian Cultural Arts Alliance (adjacent to the Center at 225 NE 59 Street) hosts open studios by photographer Carl Juste and painter / sculptor Edouard Duval Carrie. 7th Circuit Studios (228 NE 59 Street) welcomes the public to a free open studio from 7PM-10PM. Out of the Anonymous and DJ Franky Helix. Plus live painting by Jose Mertz. 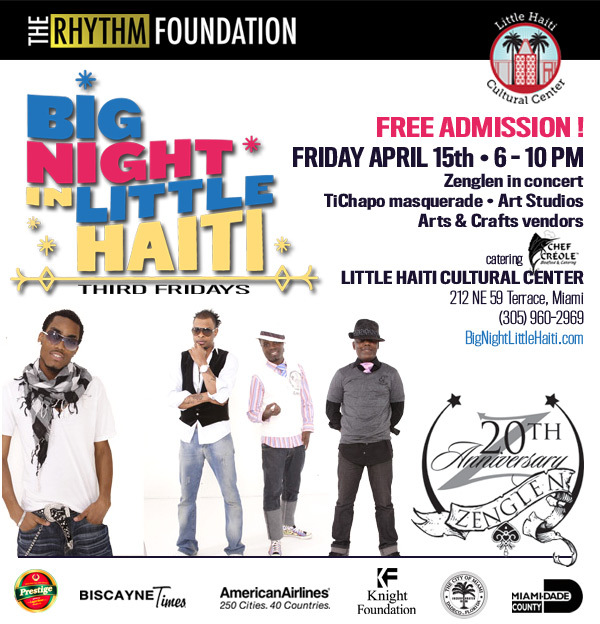 ..is produced by The Rhythm Foundation & The Little Haiti Cultural Center. Major support is received from the John S. and James L. Knight Foundation’s Knight Arts Challenge Grant. Additional support is received from American Airlines, Biscayne Times, City of Miami, Prestige Beer. 7th Circuit Studio228 NE 59 St. 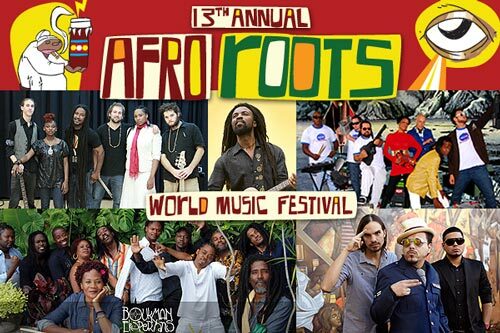 The 13th Annual Afro Roots World Music festival focuses on celebrating the evolution of African Culture in our community. Noted by many to be Miami’s longest running World Music festival, the event has featured artists from various African countries such as Senegal, Ivory Coast, Guinea, Mali, and the Republic of Congo, as well as artists from the Caribbean and the Americas. The festival also features a variety of satellite events such as, the Festival of the Drum, the kick off celebration, and a variety of panels and workshops. This global connection through music has helped the festival evolve into one of Miami’s most culturally diverse events. 7th Circuit Productions, Urban Resource, Prestige Beer & Kulcha Shok Muzik.